Play Minecraft anywhere, anytime on any computer: Your game, your Worlds, your mod launchers, all your Minecraft experience on your wrist. Automatic back-up of your entire Minecraft folder. No complicated installs. Simply plug Game band into the USB port of your Mac, Windows or Linux computer and click on the Game band App to play. 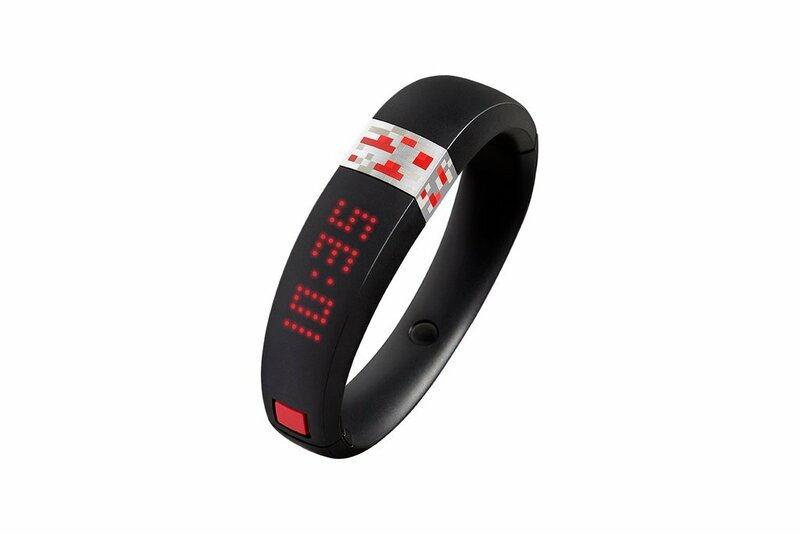 Each Game band is customizable to showcase messages, images and animation on the LED display right on your wrist. Game band comes in two sizes: Small and Large. Each holds up to 8GB of information. Size: Large The perfect holiday gift for any self-respecting Minecrafter. Simply plugGameband into the USB port of any Windows, Mac or Linux computer, launch theGameband App, and then enjoy endless fun creating and playing your favoritegame. Featuring ultra-fast, long-lasting hardware, Gameband saves your Worldsand also backs them up onto our secure, cloud-based servers. Lose it? Contactus and order a replacement with all your data intact. Gameband ships with thePixelFurnace App which lets you customize it with messages, images andanimations and share them via pixelfurnace.com. Gameband comes pre-loaded withstunning maps from Seth Bling, Hypixel and Dragnoz.Gameband lets you playMinecraft on any computer & backs-up your entire Minecraft folder! From the Manufacturer Play Minecraft on Any Computer Use Gameband to play on any Windows, Mac or Linux computer. No complicateddownloads or installs; simply plug, play and take your Minecraft Worlds, Mods,server IP addresses, resource packs and texture packs anywhere. (Minecraftlicense sold separately) Hack' your Gameband Use the PixelFurnace App to customize Gameband's LED display: showcase time,date or create your own images and animations and share them with otherGamebanders via PixelFurnace.com Double Safety Gameband saves all of your Minecraft data onto the band and also backs it upour secure cloud based servers. Lose it? We can ship you a replacement at areduced price with your data intact. Built to Last Gameband is made from durable black TPU, secured by a hand-painted stainlesssteel clasp, splash proof to IPX-4 standards, and robust enough forsignificant everyday wear and tear. Preloaded Adventure Maps Gameband ships with pre-loaded stunning maps from Minecraft superstars likeSeth Bling, Hypixel and Dragnoz. Take your entire Minecraft experience anywhere. Elegant, rugged and functional, Gameband is the ideal gift for any hard coreMinecrafter. About the Startup Describe your product in 3 words. Minecraft. Fun. Wearable. How did you come up with the idea for this product? Kids love Minecraft, and kids move around a lot and have access to variouscomputers. The idea for Gameband Minecraft simply came from that, creating aneasy and fun way for players to take the game they love with them whereverthey go! What makes your product special? Gameband is a unique, high-end, durable Minecraft inspired device; nothingelse like it exists. Aside from it allowing Minecrafters to take the game theylove with them everywhere they go, its display can be customized, allowingplayers to create, display and share animations with their friends. What has been the best part of your startup experience? The best part of this startup experience has been seeing the customer'sreaction to the final product. From design to manufacturing, creating aproduct is both fun and challenging but ultimately seeing the smile on acustomer's face when they open the box, or hearing feedback (like how theynever take Gameband off!) is what makes it all worthwhile.